The Ocean Cleanup system deployed in the Great Pacific Garbage Patch to sweep up plastic trash at the ocean’s surface. SAN FRANCISCO — It turns out clearing out thousands of tons of plastic from the world’s oceans is harder than it looks. 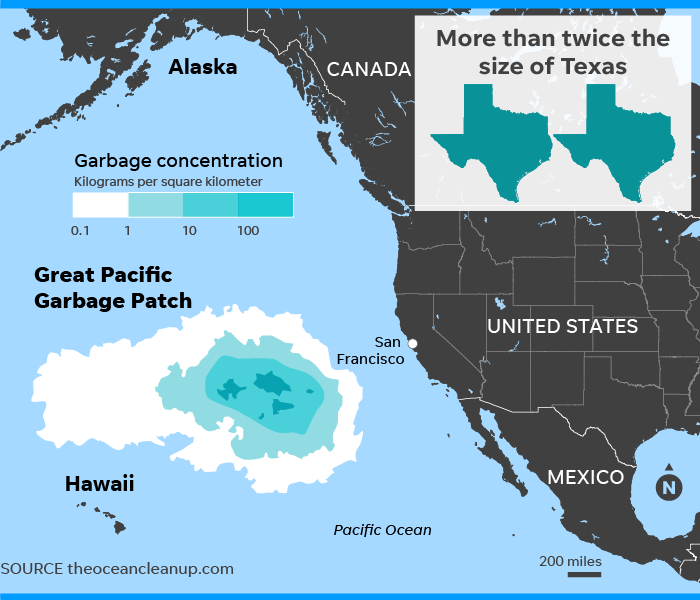 The ocean cleanup system deployed to the Great Pacific Garbage Patch to much fanfare in October is having trouble holding on to the plastic pollution is was created to corral. The passive system created by The Ocean Cleanup out of Rotterdam involves a floating series of connected 4-foot booms that form a giant horseshoe at the surface of the ocean. It steamed under the Golden Gate Bridge on Sept. 8, on its way to its destination. After two and a half weeks of testing about 800 miles off the coast, it was towed to its final spot in the midst of the slow-moving whirlpool of garbage that collects in what’s called the Great Pacific Garbage Patch halfway between California and Hawaii. There, it was meant to corral the plastic garbage via a 9-foot skirt that hangs down in the water below the boom. The action of the currents and waves was expected to push trash into the system’s center while the tiny pieces of floating plastic were captured by the hanging barrier. It hasn’t exactly gone as planned. The Ocean Cleanup team isn’t exactly sure why things aren’t working that way, though they have a few theories. One is that the force of the wind against the system might be making both extreme ends of the floating pipe to oscillate back and forth like a fish’s fin. That motion could counteract the force of the wind and slow the system down. “It is also possible that the vibrations in the ends of the U-shape could be creating a type of ripple-force field that repels the plastic away from as it nears the mouth of the system,” said the group’s 24-year-old CEO Boyan Slat on the website. The team of researchers and staff on site with the device are testing possible fixes. They are opening the U-shape of the opening about 200 feet wider than before. This should theoretically increase the surface area of the system that’s hit by the waves and water that drive in speeding it up. It could also reduce the potential propulsive force caused by the ends “simply because it would not be directed straight into the motion direction of the system anymore,” Slat wrote.